The story of such a woman would normally be of little consequence to the Pinkerton agency, whose near legendary history included involvement in cases that were the envy of many, including providing for the personal security of President Lincoln during the Civil War. An innovation that is associated with Allan Pinkerton, the founder of the agency, would now be brought to bear on Mrs. Logie, who was already suspicious of strangers trying to link her to her past. The playing of a role, a pretense using a false identity, was a Pinkerton staple that was now employed by two of its operatives. Near Crabtree’s livery stable in Tombstone was a building known as the “San Jose House,” a boarding house which was run by Samantha Fallon. The Pinkerton approach was to track down this former Tombstone boarding house operator to see if she could indeed prove or disprove whether Jack Crabtree had indeed fathered a child in Tombstone. If so, there would be a blood relative of Lotta Crabtree’s still alive, which would prove Carlotta Cockburn’s case. In tracking down Samantha Fallon, aka, Mrs. Logie (aka Mrs. Taylor, and potentially other names), the Pinkertons got far more than they had expected. Decades after leaving Tombstone and the San Jose House, of which she was the first owner, Mrs. Logie was still operating an informal boarding business in Glendale, California. Many believed that she would be able to offer testimony that could prove whether Jack Crabtree’s wife had indeed had a daughter born in Tombstone. By 1925 Carlotta had grown up and was now in pursuit of this near $4,000,000 fortune. She had a strong case that she expected to prove her to be the daughter of Mrs. Jack Crabtree, and in turn, this should mean by default that she was also the daughter of Jack. It was a simple equation that had convincing merits to it, but would those merits claim the inheritance? This scenario would create a challenge for the Pinkertons of an ethical nature, as they sifted through thousands of words dutifully typed in reports based on their fastidious surveillance. After considerable detective work, the Pinkertons followed up on their leads. A team of two agents, a man known as “A.X,” and a woman known as “E.L.B.,” who in real life were married to each other, would now make contact with their target of study. Agent E.L.B would approach Mrs. Logie in an undercover fashion, with hopes of becoming her new boarder. The Pinkertons had a lucky break, as Mrs. Logie had just placed a sign in her window offering a room to rent. This was an opportunity that they would not fail to exploit. It would allow Agent E.L.B. unique access to her subject, and if she could gain her trust, she might be able to unlock the secrets of this part of Tombstone’s story. 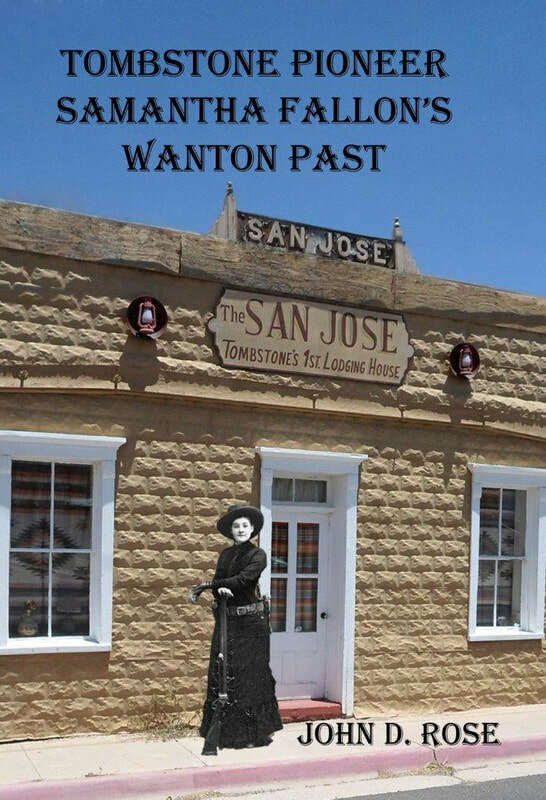 Because of these combined circumstances, what follows is a remarkable insight not only into the memories and mindset of the former Samantha Fallon, but into an aspect of Tombstone’s history thatnewspapers or other records often bypassed. It would also uncover a relationship between Samantha Fallon and Tombstone’s Founder, Ed Schieffelin, who had become wealthy from his rich silver discoveries from which Tombstone was created. Some of that wealth, would ultimately find its way to the benefit of Samantha Fallon. Agent E.L.B. had been sent to meet Mrs. Logie (aka, Samantha Fallon) and she would soon gain her trust as well as some of her friends. the discussions between spy and subject would become more personal in nature. “This morning after I returned to the house after breakfast, Mrs. Logie and myself went to the Methodist Church for the morning service. At 11:45am I left the church with several of my new acquaintances and two of them inquired of me if Mrs. Logie has started to fuss with me because former roomers had to either leave or have many fights as Mrs. Logie is a very nervous and very peculiar person. “These women were surprised to hear that I am getting along with her and I told them that Mrs. Logie and myself are always together. I was then told she goes rummaging through her tenant’s suitcases and once a lady stopping with her [meaning staying with her] missed many of her things. I have noticed that she has messed my things in my suitcases but I have not missed anything yet. I am leaving all my suitcases open as there is nothing there for her to steal. After the usual gossip I was joined again by Mrs. Logie and I accompanied her back home and afterwards went to town to have lunch. 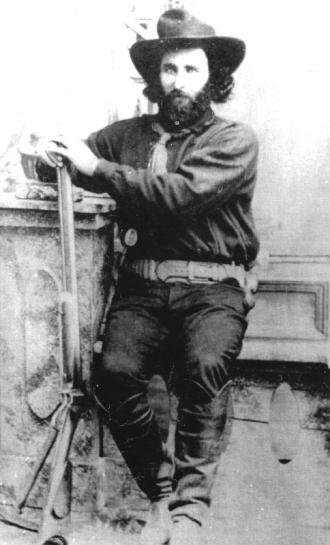 Tombstone Discoverer Ed Schieffelin, who aided Fallon financially as she built the San Jose House. This was clearly a turning point in the life of Samantha Fallon/Mrs. Logie. It may have also been part of why she was so bitter in her old age about her economic struggle. Logie’s repeated comments about how poorly her husband made his investments may have been fueled partly by her regret over the loss of her relationship with Schieffelin, who was indeed the discoverer of Tombstone’s early mines, becoming wealthy in the process. The fact that he was unhappy with her “running around with other men” points to a lifestyle that befits a woman of the “sporting crowd,” and if she were involved with these men in a way that borders on prostitution, she may have rationalized her behavior as simple business transactions, thus the defense that nothing immoral took place. The larger question is one that perhaps Mrs. Logie herself could not or maybe would not have been able to address honestly. Why over four decades later did she still miss Ed Schieffelin? Was she capable of genuine affection? Or was it a painful understanding that her youthful indiscretions had cost her perhaps her one true chance of living a life of great wealth and leisure. Ed Schieffelin may well have been the only man who had ever cared for her who could fulfill her dreams of nearly endless resources with which to indulge her every whim. Turning her down may well have been the best decision he made, as life with Samantha Fallon might have been a complicated, expensive, and trying event. Mrs. Logie continued to add names to her conversation with Agent E.L.B. 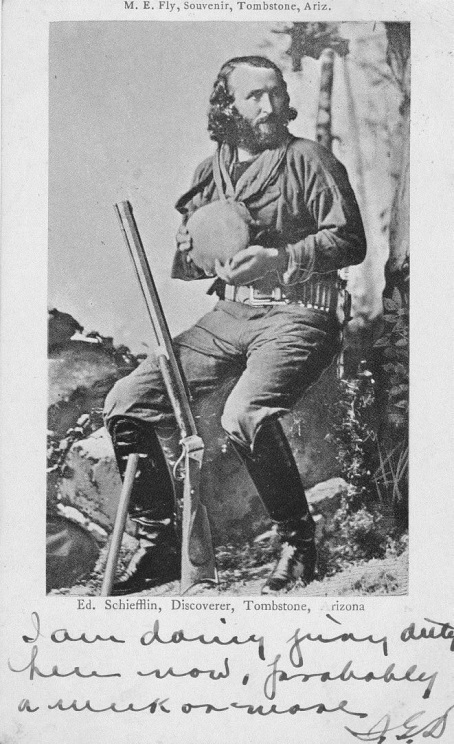 “The John Douglas referred to in her story was one of her affinities and his sons are still in Tucson, which is a comparatively short distance from Tombstone. At that time he was the owner of the stage station at Tucson, Arizona. Two other roomers were Mr. Richard Gird and a Mr. Gorman.” That Richard Gird may have roomed at the San Jose House follows the link between him and Tombstone’s founder, Ed Schieffelin, the two having formed a winning partnership of mineral and mining savvy, and incomparable organizational and business skills. Further, Gird wed in early 1880, and Logie’s claim that he roomed at the San Jose House, which opened near the same time frame, is fascinating, although the accuracy of her statements cannot be proven. 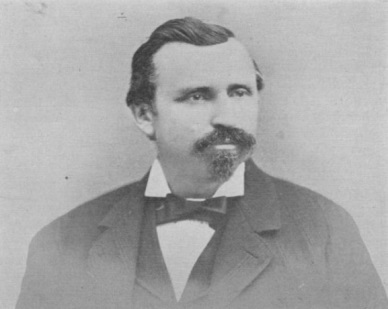 Richard Gird, partner of Ed and Al Schieffelin, whom Mrs. Logie claimed spent time at the San Jose House. Agent E.L.B. was about to learn more about the Glendale, California reputation of Logie, this time from a neighbor who told a cautionary tale. Under the guise of wanting “to borrow something” from Logie, a Mrs. Johnson, a nearby neighbor, paid a visit. But Mrs. Johnson chose a moment when Logie was at another neighbor’s house, and given the proximity, may have watched her go to the neighbor’s house in hopes of prying information about her from this new roomer. As agent E.L.B. wrote, “This morning Mrs. Johnson, a neighbor, came to the house to borrow something from Mrs. Logie and as Mrs. Logie went to a nearby house to see another member of the church, Mrs. Johnson waited for her to return and while alone with me she wanted to know if I had known Mrs. Logie very long. I answered negatively and informed her that I knew Mrs. Logie only by chance while looking for a room to rent.” Agent E.L.B. was handling a nosey neighbor’s query well, and if she had not, this one conversation could have easily blown her cover and ruined the operation. “Mrs. Johnson wanted to know how Mrs. Logie behaves herself with me, if she gets cranky, etc. I told Mrs. Johnson that I find Mrs. Logie to be a very fine old lady and very educated and she agreed with me that Mrs. Logie is a fine woman but nevertheless she told me to watch my things, otherwise I will miss something, as Mrs. Logie has the habit of stealing things from her roomers and for this reason she has bad luck in trying to keep roomers in her house. Mrs. Johnson then told me that Mrs. Logie landed in Glendale four or five years ago and no one was ever able to learn where she comes from. She is an awful story teller, Mrs. Johnson remarked; once she comes from Arizona and then she comes from entirely different states but no one really knows her real past.” It is indeed ironic that Mrs. Johnson would make such a statement to perhaps the only person who had a real chance of unraveling her murky and contradictory story. Fallon didn’t marry Schieffelin or Ed Bullock, the latter being the true love of her life. She would instead marry Zachary Taylor, who like Ed Bullock, was interested in the local livery business in Tombstone. 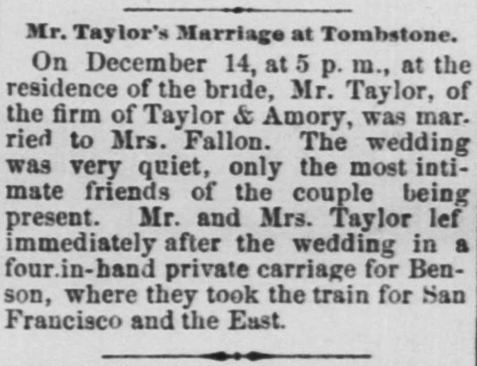 Samantha Fallon marries Zachary Taylor, though she would later state that she never loved him. Weekly Arizona Citizen, December 18, 1880. The above information is in part excerpted from Tombstone Pioneer Samantha Fallon’s Wanton Past by John D. Rose. This book contained so much new research and breakthrough that awarding winning Tombstone researcher and writer Robin Andrews stated that “Samantha Fallon of Tombstone, Arizona (1880) has always been a character in history that interested many of us in the Earp/Tombstone, Arizona history field. Like many others, she was one of those who seemed to have teetered on that fence between good and bad, which is probably why she has always intrigued us. She had enough association with the good side to make us wonder if the gossip of her living on the bad side was just that, gossip by old timers and their self serving stories. “John D. Rose, a well known Arizona artifact collector, historian and prolific writer, has once again brought to the public, from a court case pulled out of the musty old files of "Archivaldom" an interesting and entertaining story for those of us who just can't get enough of Tombstone's vividly colorful Old West history. For those of us who's passion it is to do biographical works on 19th century Arizona citizens, it is a bit difficult at times to get a real feel for the personal side of that person 'long at rest'. When we only have the official records to go by, the story often times lacks the personal substance that brings the story to life. This book is different. Click the book cover below to order a copy.